Perched on a rocky outcropping over the Pacific, this Mediterranean-style estate built a decade ago has a 3,900-square-foot home and two guesthouses for a total of six bedrooms, on about 3.7 acres of oceanfront property. The two-story concrete-block home has front doors of stained glass that open to a large living and dining area with double-height ceilings and a pentagonal kitchen. There are stained-glass accent windows throughout this level; cabinetry and closets throughout are of cedar, and floors are of imported Italian tiles. From the living space, huge sliding glass doors lead to a 50-foot pool and a landscaped patio and pool deck. The main floor also has two bedrooms, each with a walk-in closet and a bathroom. A mezzanine over the living/dining area has a small gym. The second floor has a master suite with a Jacuzzi, a walk-in closet and a large private balcony. Bordered by patios, the main house is designed to be open to the elements, although each bedroom has an air-conditioning unit. By the pool is a cabana with his-and-hers baths, an outdoor shower and a wet bar. The pool furniture is cast concrete painted bright green and yellow. (Furnishings are included in the asking price.) A large covered barbecue area is below the pool area. “The weather here in Nicaragua is wonderful year round,” said Zach Lunin, the listing agent with Aurora Beachfront Realty, “and you can have an open-style house, and a lot of the living you do will be out in that pool cabana and out on that deck, soaking in the beautiful views, listening to the waves splashing up against the rocks.” The estate includes about 820 feet of ocean frontage. A 1,900-square-foot guesthouse, uphill from the main house, has two bedrooms and baths and a kitchen. The other 485-square-foot guesthouse is a one-bedroom apartment with cedar cabinetry and built-in cedar storage, along with two patios with ocean views. A six-person staff, paid a total of about $12,000 a year, is available for hire. There is also a gatehouse and a garage for four cars, in addition to a parking lot that can accommodate about 15 cars. The house is in an exclusive subdivision called Pacific Marlin, which currently has about 30 high-end homes, most on quarter- or half-acre lots, and is zoned for 120. This home is about a five-minute drive from the small town of San Juan del Sur, on a bay of the same name. The town of about 16,000 caters to tourists and has about 20 restaurants as well as grocery stores and other shops. Offshore breezes most of the year create world-class surf. This home has a rocky shoreline, but there is a beach in San Juan, and popular surfing beaches are about 15 minutes by dirt road north and south of town. Residents are an hour and 50 minutes from two international airports, one in Nicaragua’s capital, Managua, and one in Liberia, Costa Rica, but Augusto C. Sandino International Airport in Managua is more accessible, Mr. Lunin said. Nicaragua has a fledgling residential real estate market, with the first contemporary homes built around 1998, agents said. Even so, by about 2005, there was a bubble in the market that burst in 2008, and prices on some homes fell by as much as 50 percent, said David Joyce, a broker and owner of Re/Max Colonial Properties in Granada. During the past three years, prices have stabilized at those lower levels, said Carlos Amador Torres, the president of Discover Real Estate, which has offices in Managua. “Homes are selling at a steady pace now,” he said. 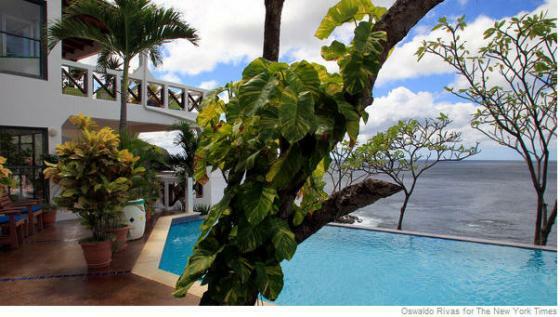 Americans and Canadians are the most prevalent foreign buyers in Nicaragua, and they want either newer homes in the coastal areas or historic colonial homes in Granada or León, Mr. Amador said. Mr. Joyce says he also sees some buyers from Holland, Britain, Germany and France. And Mr. Amador said that after the leftist Daniel Ortega was elected president in 2007, there was an increase in buyers from Russia, Spain and Venezuela. Real estate statistics in Nicaragua are difficult to obtain, but Mr. Joyce said that an attractive colonial home in Granada costs anywhere from $150,000 to $350,000. Many buyers are looking for retirement homes; others hope to obtain rental income from their property, agents said. Lots in Pacific Marlin currently go for $75,000 to $450,000, depending on size and view, and homes listed for sale range from $349,000 to $2 million, Mr. Lunin said. Nicaragua does not yet have a licensing system for real estate agents — a fact that turned the boom years into a bit of a free-for-all, with title issues being a particular problem for some buyers, agents said. The first step in buying a home is finding a reputable agent, which has been made easier by the global financial crisis: before 2007, there were about 30 brokerages in tiny San Juan; now there are three, two with actual offices in town, Mr. Lunin said. A lawyer is also recommended, Mr. Amador said, first and foremost to conduct a thorough chain-of-title search to ensure the home is actually owned by the seller. Qualified Spanish-speaking lawyers are available for about $600, but English-speaking lawyers from Managua will charge closer to 1.5 to 2 percent of the home’s sales price, Mr. Joyce said. Most agents recommend title insurance, even with a good lawyer. Buyers usually pay in cash, as borrowing from local banks is difficult, agents said. Though mortgages can be obtained, the requirements are stringent, and interest rates in recent years have been as high as 12 percent, though now they’re closer to 9 percent, Mr. Amador said. Property taxes are about $3,500 a year; the homeowner’s fee is $800 a year.